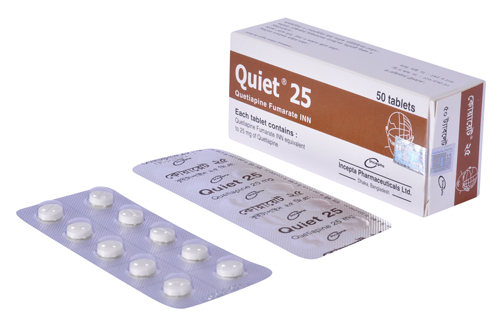 Quiet 25: Each film coated tablet contains Quetiapine Fumarate INN 28.728 mg equivalent to 25 mg of Quetiapine. 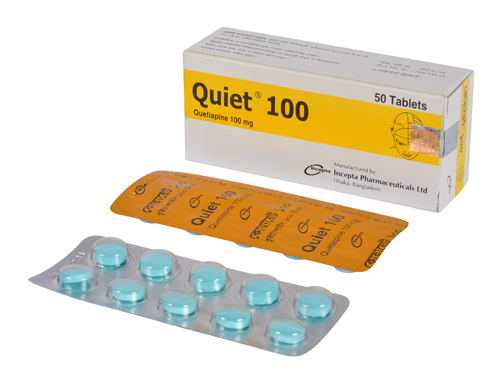 Quiet 100: Each film coated tablet contains Quetiapine Fumarate INN 115.126 mg equivalent to 100 mg of Quetiapine. Quetiapine Fumarate is an atypical psychotropic agent belonging to a chemical class, the dibenzothiazepine derivatives. Quetiapine is an antagonist at multiple neurotransmitter receptors in the brain: serotonin 5HT1A and 5HT2, dopamine D1 and D2, histamine H1, and adrenergic a1 and a2 receptors. Quetiapine has no appreciable affinity at cholinergic muscarinic and benzodiazepine receptors. The mechanism of action of Quetiapine is unknown. However, it has been proposed that this drug\\\'s efficacy in schizophrenia is mediated through a combination of dopamine D2 and serotonin 5HT2 antagonism. Quetiapine\\\'s antagonism of histamine H1 receptors may explain the somnolence and that of adrenergic a1 receptors may explain the orthostatic hypotension observed with this drug. Elimination of Quetiapine is mainly via hepatic metabolism with a mean terminal half-life of about 6 hours. Steady-state concentrations are expected to be achieved within two days of dosing. Quetiapine is unlikely to interfere with the metabolism of drugs metabolized by cytochrome P450 enzymes. Quetiapine Fumarate is rapidly absorbed after oral administration, reaching peak plasma concentrations in 1.5 hours. The tablet formulation is100% bioavailable relative to solution. The bioavailability of Quetiapine is marginally affected by administration with food, with Cmax and AUC values increased by 25% and 15%, respectively.It is 83% bound to plasma proteins at therapeutic concentrations. Following a single oral dose less than 1% of the administered dose is excreted as unchanged drug. Approximately 73% and 20% of the doses were recovered in the urine and feces, respectively. Quetiapine is extensively metabolized by the liver. Bipolar Mania - Quetiapine is indicated for the treatment of acute manic episodes associated with bipolar I disorder, as either monotherapy or adjunct therapy to lithium or divalproex. Data indicates that the majority of patients responded between 400 to 800 mg/day. The safety of doses above 800 mg/day has not been evaluated in clinical trials. Usual Dose: Quetiapine should generally be administered with an initial dose of 25 mg bid, with increments of 25-50 mg bid or tid on the second and third day, as tolerated, to a target dose range of 300 to 400 mg daily by the fourth day, given bid or tid. Further dosage adjustments, if indicated, should generally occur at intervals of not less than 2 days, as steady-state for Quetiapine would not be achieved for approximately 1-2 days in the typical patient. When dosage adjustments are necessary, dose increments/decrements of 25-50 mg bid are recommended. Most efficacy data with Quetiapine were obtained using tid regimens, but in one controlled trial 225 mg bid was also effective. Neuroleptic malignant syndrome, tardive dyskinesia. Hypotension and syncope, especially during the initial dose titration period. Conduct eye examinations prior to or shortly after starting Quetiapine and at 6-month intervals thereafter; discontinue the drug if clinically significant lens changes are observed. History of seizures. Hypothyroidism. Hyperprolactinemia. Antiemetic effect. Suicide. Use with great caution in moderate or severe hepatic impairments. Renal impairment, cardiovascular disease. Disruption of body temperature regulation. Hyperglycemia. Lactation (avoid breast-feeding). Pregnancy Category C. There are no adequate and well-controlled studies in pregnant women and Quetiapine should be used during pregnancy only if the potential benefit justifies the potential risk to the fetus. Nursing Mothers: It is recommended that women receiving Quetiapine should not breast feed.